At Rocking Chair Ranch, it is our goal to provide you with the best tasting, healthiest grass-fed beef options possible. In recent years, grass-fed beef has become the "trendy" grocery option for many people. Consumers across the country are becoming more aware and concerned about what they are eating and how the animals they consume are being raised and treated. Rocking Chair Ranch CEO and Cattleman, Joseph Egloff, is a third-generation cattle farmer who has been ahead of the "trend". Joseph knows how to raise cattle the way nature intended, and has been doing it his entire life. Through our careful breeding program, strict nutritional standards, and humane farming practices, we intend to bring you the best beef we possibly can. “Hello, my name is Joseph Egloff. I'm the chief bottle washer at Rocking Chair Ranch Cattle. We are a small cattle operation that started seven years ago with the idea of serving a local burger in downtown Macon. My goal was to process about 12 head of cattle a year. Then I realized that people wanted more than just ground beef. We now process about 90 head a year. We are a regular vendor at several local famers markets, and we now supply many local restaurants and retail grocers. I do everything from vaccinating and working the cattle, to delivering the product into the hands of the consumer. We don't have a large staff - but, I don’t know where I’d be without the help of our team. I named my farm ‘Rocking Chair Ranch Cattle’ as a tribute to my Daddy. When a piece of farmland in Okolona, MS came up for sale, my Momma and Daddy decided to buy it. Daddy said they would put rocking chairs on the front porch and watch the kids grow up. But that October, before they could purchase the farm, my Daddy passed away. Foraging on bermuda grass in the summer and a mix of fescue and white dutch clover in the winter, Rocking Chair cattle are the products of a carefully selected cross-breeding program intended to insure consistent quality and flavorful beef. By cross-breeding for selective traits that include heat and drought tolerance, longevity, disposition and meat quality, Rocking Chair Ranch is committed to providing great-tasting meat with minimal environmental impact. Tended to daily checking for health and overall well being to make sure we are raising happy, healthy cows! Fed only grass and forage after they are weaned. Rotated on approximately 300 acres maintaining fresh grazing. Raised on pasture without confinement to feedlots. 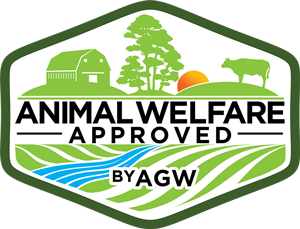 Our processing facility is also Animal Welfare Approved! We are members of the American Grassfed Beef Association and we are Certified Animal Welfare Approved.